Yesterday we got our first real look at color prototypes for the upcoming Figma Gridman & Grid Knight from SSSS Gridman. Both look phenomenal in what little we could glean from the Figure Oh scan. Today however GSC has released a single hi-res look at this fair together for the first time! This offers the absolute best look yet at either of these Figma’s and I have to say, they look incredible together. The post this image was attached to also indicates that Figma Gridman pre-orders will begin on January 19th. In another surprise teaser, Goodsmile has announced that they are indeed working on at lest one Kaiju from the series. No, we don’t just mend the adorable clay model Kaiju that Nendoroid Akane Shinjo comes with, this is apparently going to be some sort of full size figure of Ghoulghilas! The cyborg like dragon monster which Gridman faced in the first episode of the series. While GSC has not indicated if this will be some sort of full scale DX, Figma, or maybe even just a vinyl figure, it’s pretty promising to see a Kaiju from the series being worked on. It was anounced in the same GSC blog update as the new Figma image. As more information about Gridman, Grid Knight, and Ghoulghilas becomes available we’ll be sure to keep you informed. 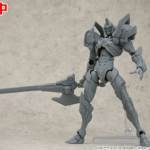 SSSS Gridman Minipla Release Announced! Bandai has announced a new release for their highly successful Minipla figure-building series! This new release features SSSS Gridman, from the Studio Trigger anime of the same name. SSSS Gridman has proven highly successful and this announcement is merely the latest in a long line of tie-in merchandise. At the moment only Gridman himself is shown but based on previous Minipla releases it seems likely that Gridman’s Assist Weapons will be included as well. No price has been announced yet but SSSS Gridman is tentatively scheduled for release in Summer 2019! The Studio Trigger anime series SSSS Gridman has received incredibly positive reception thus far, and multiple retailers are ready to show some love to this digital hero! 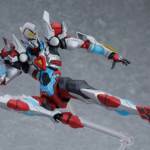 Max Factory has revealed a full prototype of a Gridman figure to be included in their Figma action figure series. 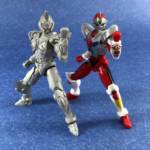 This line is generally similar in scale to SH Figuarts– although plastic quality varies. The Gridman Figma is pictured with his signature weapon, the Electrifying Great Sword Gridman Caliber! 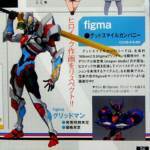 Sadly, no release details on Figma Gridman have been announced at time of writing. Stay tuned to TokuNation for all Gridman reveals! 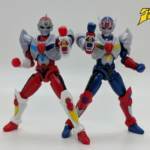 With one of these having only been revealed earlier this week, we now have official images of the two soon to be released SSSS.Gridman Strong Style Soft Vinyls! Fine Clover, the company producing vinyls for both Denkou Choujin Gridman and SSSS.Gridman, revealed on Wednesday that they would be including a special Initial Fighter Gridman vinyl with the Special Edition Blu-Ray Volume 1 box for SSSS.Gridman. Now we have our first official image of this vinyl. 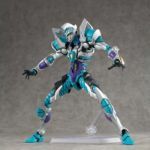 At the same time, Fine Clover has also released some official images for their retail release of Primal Fighter Gridman. Primal Fighter Gridman is due out at regular retail in late December for 3980 yen. 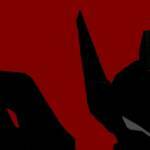 Release details and official images for their previously teased Denkou Choujin Gridman have not yet been released. But we’ll keep you up to date as they announce more releases officially.